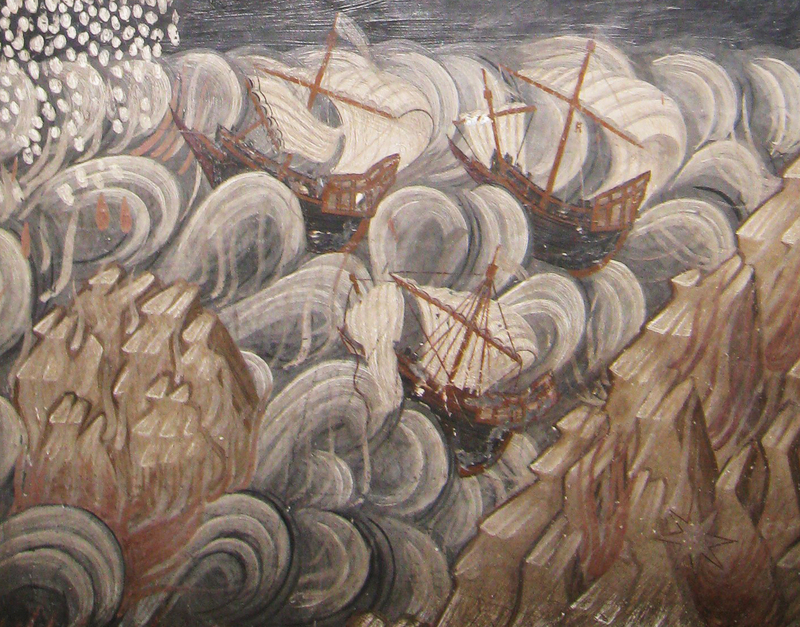 In Blogs 1100, 1103, 1110 and 1113 I showed you scene 1 to 12 from the Apocalypse of St. John. Today I continue with scene 13 (chapter 6 of the Apocalypse). 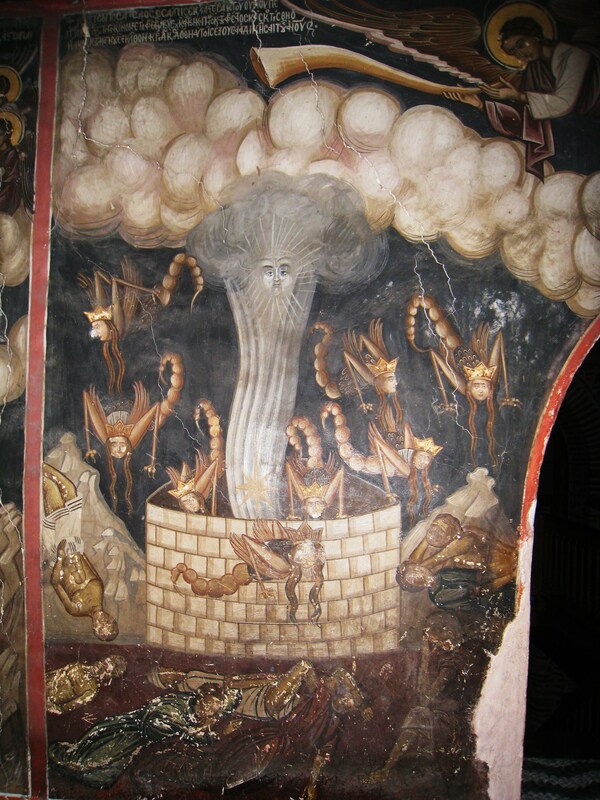 One of the most famous scenes from the Dionysiou Apocalypse : the four horsemen, including Death on the pale horse (with its eye scratched out by vandals!). 6:2. And I saw: and behold a white horse, and he that sat on him had a bow, and there was a crown given him, and he went forth conquering that he might conquer. White horse… He that sitteth on the white horse is Christ, going forth to subdue the world by his gospel. The other horses that follow represent the judgments and punishment that were to fall on the enemies of Christ and his church. The red horse signifies war; the black horse, famine; and the pale horse (which has Death for its rider), plagues or pestilence. 6:4. And there went out another horse that was red. And to him that sat thereon, it was given that he should take peace from the earth: and that they should kill one another. And a great sword was given to him. 6:5. And when he had opened the third seal, I heard the third living creature saying: Come and see. And behold a black horse. And he that sat on him had a pair of scales in his hand. 6:8. And behold a pale horse: and he that sat upon him, his name was Death. And hell followed him. And power was given to him over the four parts of the earth, to kill with sword, with famine and with death and with the beasts of the earth. 6:9. And when he had opened the fifth seal, I saw under the altar the souls of them that were slain for the word of God and for the testimony which they held. Under the altar… Christ, as man, is this altar, under which the souls of the martyrs live in heaven, as their bodies are here deposited under our altars. 6:11. And white robes were given to every one of them one; And it was said to them that they should rest for a little time till their fellow servants and their brethren, who are to be slain even as they, should be filled up. 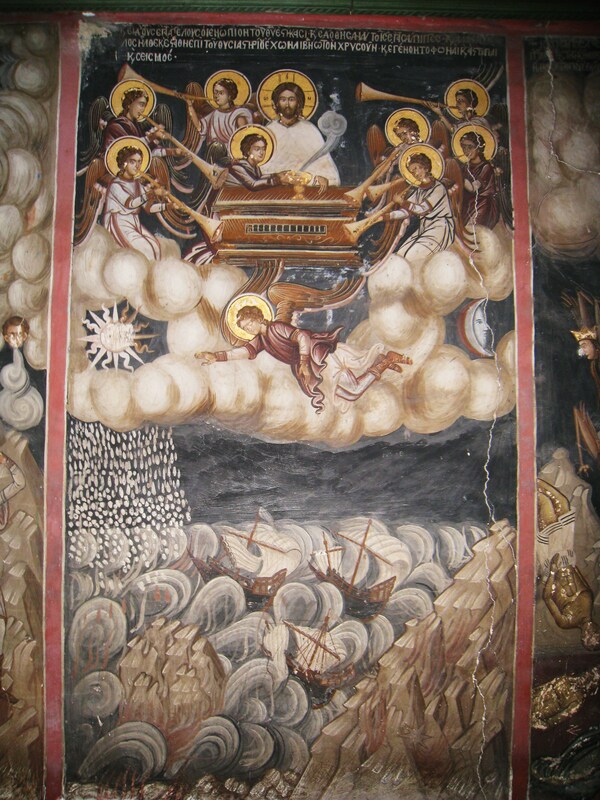 Scene 15 is the second famous fresco of the Dionysiou Apocalypse. Disaster strikes: an earthquake, falling stars and a red moon and black sun! look at the – badly damaged – faces of scared people hiding in the rocks. 6:14. And the heaven departed as a book folded up. And every mountain, and the islands, were moved out of their places. 6:16. And they say to the mountains and the rocks: Fall upon us and hide us from the face of him that sitteth upon the throne and from the wrath of the Lamb. Scene 16 is the next: chapter 7: 1-4. The marking of the 144.000 with the seal of the living God and clothed in white robes. 7:1. After these things, I saw four angels standing on the four corners of the earth, holding the four winds of the earth, that they should not blow upon the earth nor upon the sea nor on any tree. 7:3. Saying: Hurt not the earth nor the sea nor the trees, till we sign the servants of our God in their foreheads. 7:4. And I heard the number of them that were signed. An hundred forty-four thousand were signed, of every tribe of the children of Israel. 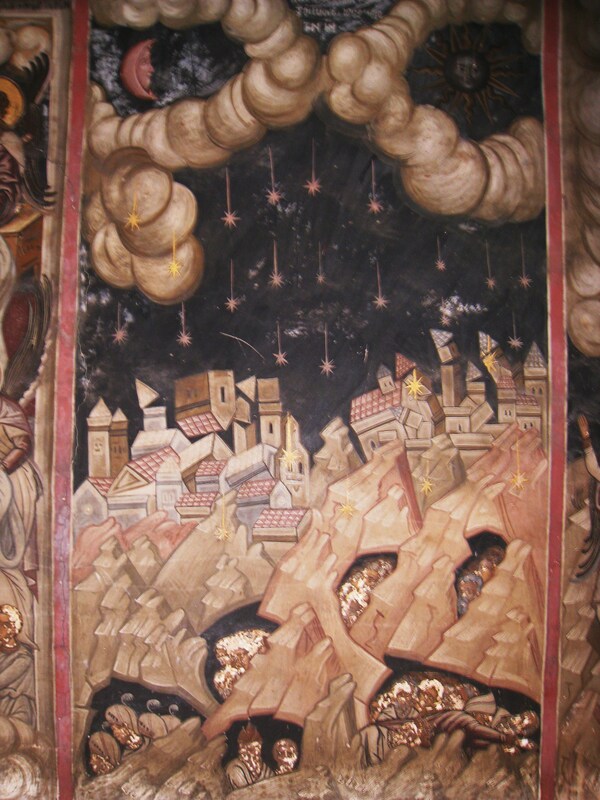 The penultimate scene is number 17: In this magnificant painting you will find all objects and scenes as mentioned below in chapter 8 of the Apocalypse: the seven angels with trumpets, the censer with smoke, a mountain in the sea, the bloody sea water, destroyed ships, the fountain of water, the star Wormwood (in the rocks in the right corner), a darkened sun etc etc. The last scene (nr 18) is from John 9:2-10: this is one of the most famous scenes of the Apocalypse and maybe of whole Athos. Some say this a prediction of the atomic bomb….. Although the mushroom cloud lookes like an nucluair explosion, in fact it is the sun covered by smoke, as you can read below (9.2). The fresco is painted in 1560-64, after an earlier engraving of Hans Holbein (1523). 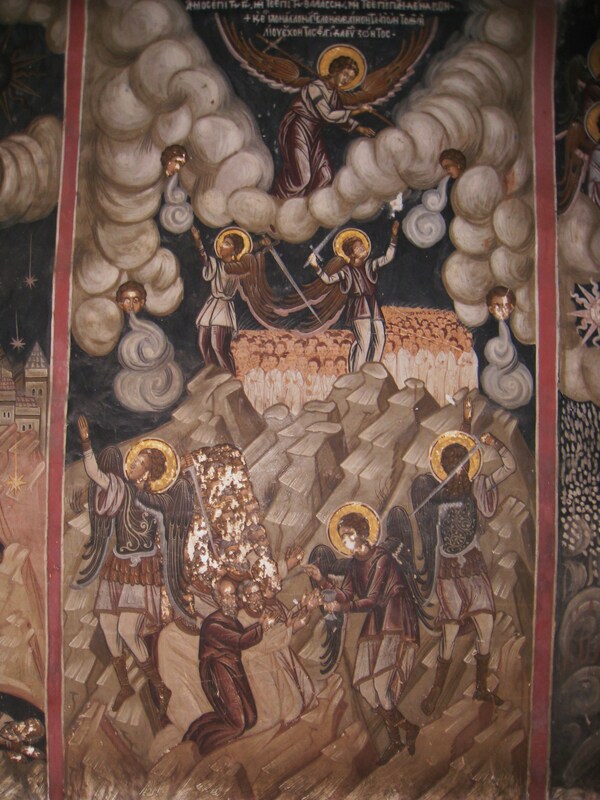 It is of an outstanding quality, probably one of the finest fresco’s on Mount Athos. 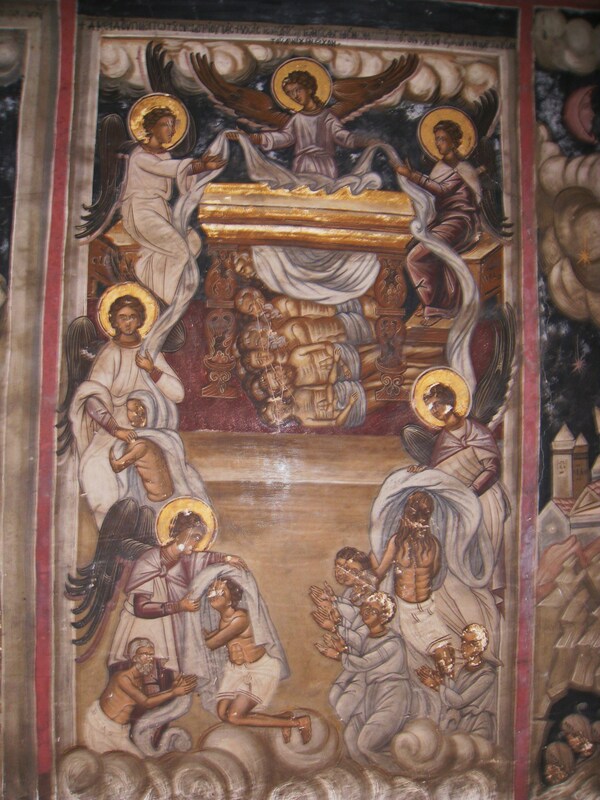 It is funny to realize that on Mount Athos you are able to see and enjoy these kind of art-masterpieces in situ, so different then art in, for example, Italian churches. In these churches and in museums it would be behind glass and well protected (and you have to pay to see it)! 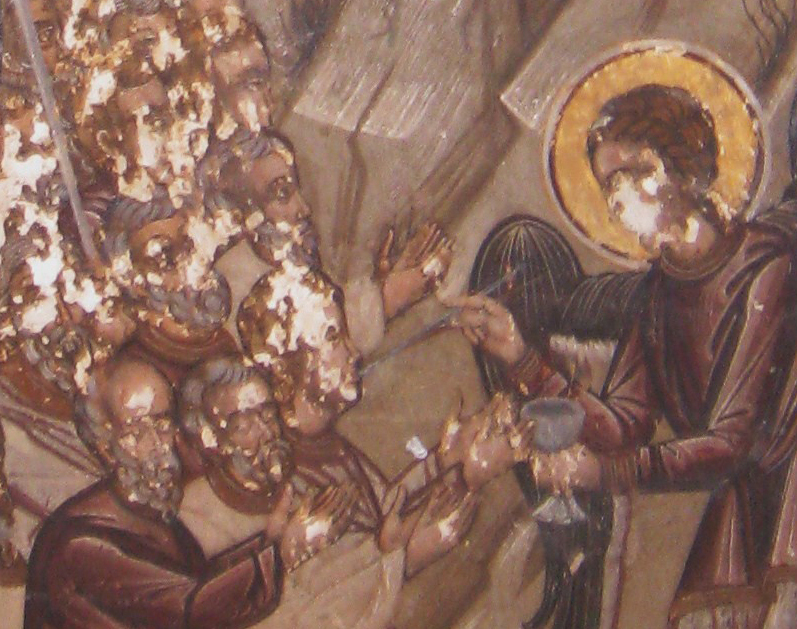 At the same time it is sad to see that the paintings are so damaged by vandals and that they are so badly preserved. I hope restauration will take place before it is too late! 9:2. And he opened the bottomless pit: and the smoke of the pit arose, as the smoke of a great furnace. And the sun and the air were darkened with the smoke of the pit. 9:3. And from the smoke of the pit there came out locusts upon the earth. And power was given to them, as the scorpions of the earth have power. 9:7. And the shapes of the locusts were like unto horses prepared unto battle. And on their heads were, as it were, crowns like gold: and their faces were as the faces of men. 9:8. And they had hair as the hair of women: and their teeth were as lions. 9:9. And they had breastplates as breastplates of iron: and the noise of their wings was as the noise of chariots and many horses running to battle. 9:10. And they had tails like to scorpions: and there were stings in their tails. And their power was to hurt men, five months. This ends the publication of the 20 scenes of the Dionysiou-Apocalypse. I think this is the first time that the complete Dionysiou Apocalypse scenes are published on the internet. The only (small) image I missed, was the painting above the door the refectory. But that gives me a good reason to go back next year. In a following blog I will continue with our hike to Gregoriou. Just discovered your blog a couple of days ago and I’m enjoying the posts. I hope to visit one of the monasteries and learn more about monastic cooking.